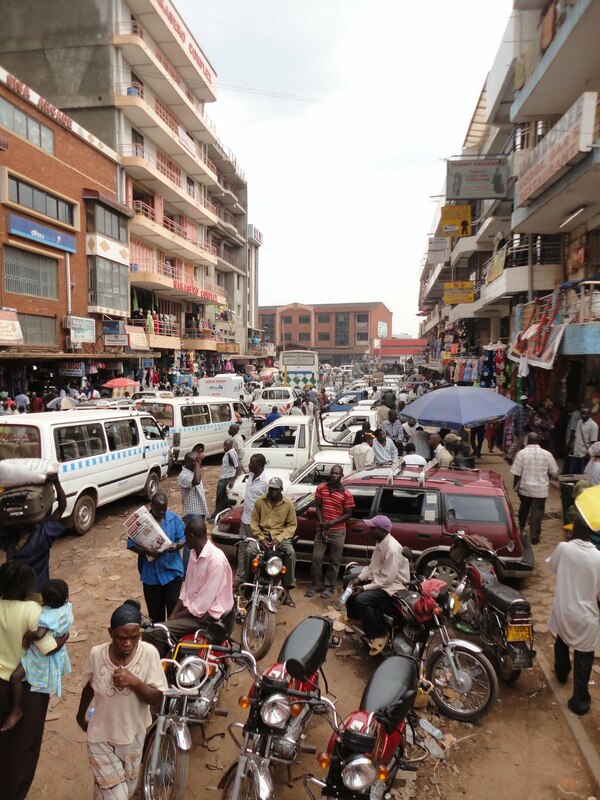 Kampala, the smokey metropolis of 12 million inhabitants, greeted our bus from Nairobi with an hour long traffic jam. As the traffic jams and insane crowds seem to be its landmark and main attraction, I took it lightly and enjoyed the hassle and bustle from the window. When we finally arrived at the station, I was dreaming of nothing else than getting to the Backpackers and having a shower. But it was not meant to be. As I was taking money from the ATM I realised I left my Lonely Planet on the bus. I got a motorbike and rushed back to the station. The bus wasn’t there. It had already left for the garage outside town. I had no choice but to follow. LP might not be that hard to get in Kampala but you never know and besides I get attached to my copies, especially when they are not really mine (this one was Janek Topolski’s, to whom this trip is dedicated). 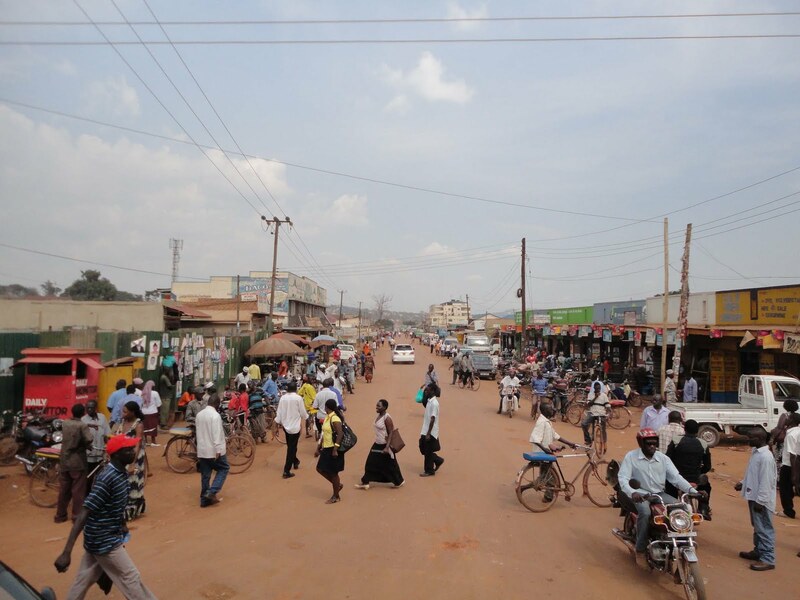 And so very early on during my stay in Kampala I had the chance to witness and partake in the crazy spectacle that driving here is. 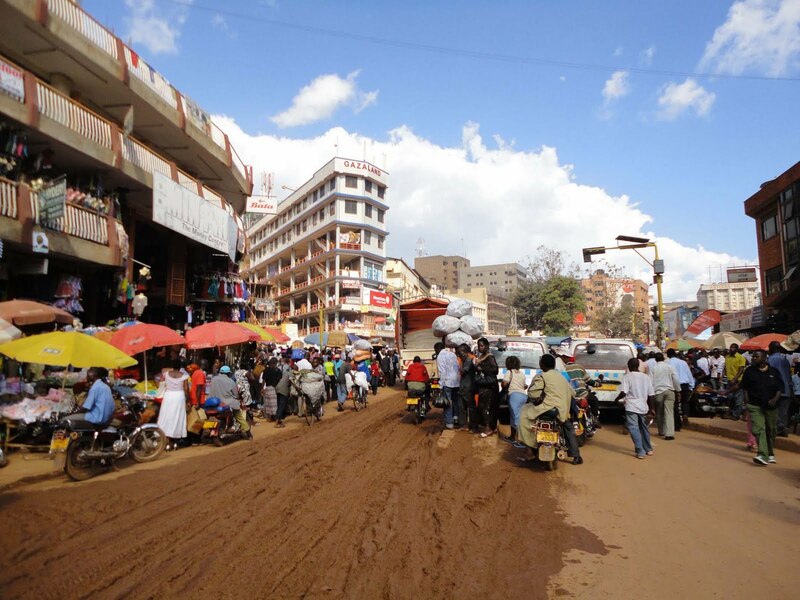 I’ve been in many places when people are famous for driving like monkeys: Saigon, Cairo, Rome, Nairobi. But Kampala beats them all. The lemming-like blindness with which they rush head-on to collisions only to awake millimetres before the other vehicles bumper is astounding. Add to it roads covered in mud, pot-holes and rubbish, as well as thousands of pedestrians milling around and you get the picture. I love it. If it wasn’t for the fact that even on the motorbike you get stuck quite often (even though they drive on pavements, rails and any other vaguely flat surface on the side of the road), I would love to drive here. It’s a constant challenge requiring agility, inventiveness and alertness. Luckily, my driver possessed all those essential qualities and we made it to the depot in good time. Too good in fact, as the bus was not yet there. We waited. The bus arrived. I was told they left my book at the station. We rushed back. We waited for the guy who had the book. We got the book back. We waited or rushed no longer. It was still quite early when I made it to Backpackers and had that divine shower. Chatted with a number of friendly backpackers, including John who cycles from Cape to Cairo like Kazimierz Nowak did. After breakfast, I left for town. The matatu dropped me at the main ‘taxi park’, a huge station/market area teaming with life. I was in a very good mood – it was so lively, African, authentic and I was so young, curious and showered. Life was looking up. And then I felt it – a slight of hand and twist of fate and there I was in a mood much dampened by a sudden disappeance of my camera and my phone! I felt them do it, turned and faced a wall of people behind me. I could just about vaguely discern a line of men which must have been passing themselves my things. I rushed after them, caught one and very loudly told him to give me my things back. Then I turned to the curious sellers who surrounded us and told them I was willing to pay as long as my things were returned. There was a lot of discussion and the guy who I confronted asked which one I wanted more. I said the camera but really both would be nice. The sellers around, obviously in the know, were very kind and offered me a seat reassuring me that there is a chance they will be returned. I did not have much hope but lo and behold after 10 minutes a man returned with my camera. And they did not even want money for it. 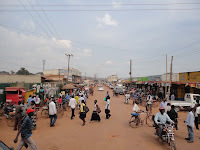 He said it gives Uganda a bad name when people steal from tourists and the people around nodded and murmured in agreement. After 10 more minutes a local police officer arrived and said that the boy who took the phone is known to them but for now disappeared so there is no point waiting. I went to the police station, made a statement in only very vague hope they phone will ever turn up again. One can only hope that what goes around, comes around and at least I had my camera, which was miracle of miracles anyway. I called Tom from the other phone and asked him to block my Polish phone. Thinking my adventures over I went to change some more money and buy Dr. Olive Kobusingye’s book, The Correct Line. Olive is a surgeon and a sister of the main opposition Presidential candidate, Kizza Besigye. The book was published in London and shipped to Uganda as no printers wanted to print a book, which in no uncertain terms denounces the 24 years of Museveni’s regime and the human rights abuses committed in that time. The shipment of the books coming from London was held up in customs for ages but this just generated more publicity for it and the people were buying it online anyway. So while not technically illegal (there is officially no censorship in Uganda) the book is not a favourite with the authorities. I went to the main bookshop and in a fairly loud voice enquired after it. The seller gazed at me surprised, suddenly looked all shifty and equally loud replied that no, of course they do not have the book. As the poets say, one could cut the tension with a knife. I realised the faux pas and in a much quieter voice asked if he by chance knows where I can get it. He lowered his even more and told me the name and address of the other bookshop. I went there and this time much more subtly, that is crouching behind one of the shelves next to a kneeling employee, I repeated my enquiry. He also looked puzzled but pleased. Unfortunately, they also did not stock it but he knew where to get it. He walked out with me and pointed me in the right direction, watching after me as I went. The last place was a dingy little stationers, not a proper bookship at all. But they did have it. Yet, by this time I was so paranoid that I was seeing secret police functionaries behind every bush. I now know how my mum must have felt while smuggling illegal Solidarity publications in the 1980s! I got back to the Backpackers and started reading my trophy book, again thinking that’s the end of excitement for the day. But it was Monday and Mondays is jam night at the National Theatre. So we, i.e. Brenda, Mira, John, Dan, Fasel, a Danish guy and I decided to check it out. 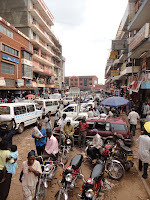 We hailed 4 boda-bodas and chased each other through the croweded Kampala night streets. That felt really good. The jam was pleasant enough although surprisingly the quality of performers left a lot to be desired. But we danced, talked, ate pop-corn and drunk beer. Maybe a little too much beer for at some point, I really don’t know how that happened, I found myself making a bet with the guys that I will join the Ugandan President’s entourage when he heads to Gulu the next morning. I had the insider info that he is setting off and thought it would be fun to interview him on the way. Now, I had to do it. It was just before midnight then when I asked the guys not to wait for me and headed outside to the next boda-boda. The night was cool but that did not lessen my enthusiasm and I boisterously ordered the driver to take me to the State House as I need to talk to the president. He obediently drove to the residence and left me with equally perplexed presidential askaris. I told them I’m a journalist who is supposed to see the president on his way to Gulu and I need a pass for tomorrow. They said its all nice and good but the president is not here but in Entebbe and if I want to ride with him I need to be there early. That I have resolved to do the very next day.